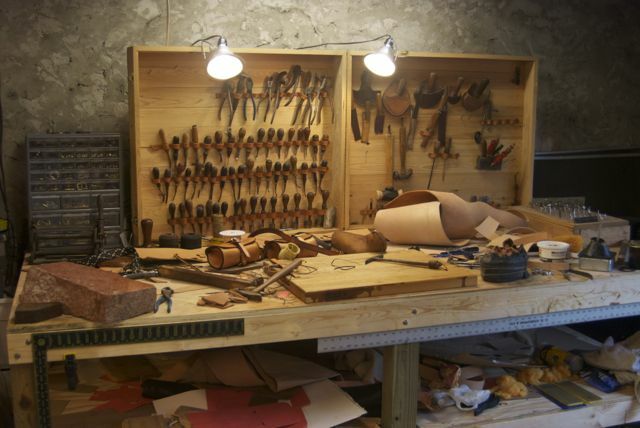 A Saddle Maker Apprentice – Art's Musings, etc. This is my current workshop. Most of the tools came from Mr. Ginder. Ginder Saddlery was located on the highway between Santa Fe and Española, just south of Pojoaque in the small town of Cuyamungue. According to Wikipedia, Cuyamungue is a “census-designated place (CDP)”, inhabited by 451 people in the 2000 census. The major landmark, about 1-2 miles south of Ginder’s old shop, is Camel Rock. Mr. Ginder lived in a house that was behind his shop, which was a renovated simple and small cinderblock house that was painted a dull pink. There was a small place for customers, with almost no display or things to buy. I recall it as being on the dark side, with little light and a lot of aged wood. The customer spot was also a refuge from the 2 large and very scary German Shepard dogs, which were separated from the public by the counters and a small gate. When a customer came into Ginder’s shop, he was greeted by ferocious barking, dogs running around and turning in circles, and Mr. Ginder yelling at them to shut up. Like many dog owners, he could make it sound to the person in the safe zone as though this was the first time that they ever barked or misbehaved, but in a year that I worked there, I never witnessed any other behavior. I learned about Mr. Ginder while I was working in the Square Deal Shoe Shop in Santa Fe. Mr. Ginder was not only a master saddle maker, but he also welcomed students. This seemed much better to me than more college, so I jumped at the chance. Katherine and I were living in a tent in the Santa Fe National Forest, about 10 miles southeast of Santa Fe, past the small village of Cañada de los Alamos, another CDP with 358 residents in the 2000 census. About 5 miles of the drive was on dirt road, and our transportation was an old International Harvester Scout (mid 70s) followed by a 1949 Studebaker pickup truck that we got when the Scout died. I don’t recall which vehicle we had when I first met Mr. Ginder, but I do know that most of the time I drove the Studebaker the 30+ miles each way to his shop each day. The first time I went to his shop to discuss options, Mr. Ginder told me that he would take me as an apprentice and that it would cost $10/day and that I would eventually need to buy my own tools. We were pretty broke, and our only source of income was Katherine’s minimum wage job at a tile shop in Santa Fe. There was also a small amount of money (likely intended for college) that I had inherited from an aunt that we had already used to buy our land in the forest. Using the rest of it for saddle making school would be a hard-sell to my parents. Fortunately, after telling Mr. Ginder that I had 2 years of experience working in shoe repair shops, we agreed on a trade: he would teach me for free, and I would do repairs for him in return. It was PERFECT! (except for the dogs that would barely let me walk past the gate to look around the shop…) This started the next major stage in my life.